Waking up at 1AM everyday is not an easy task. I take my morning shower, grab a bagel, and start loading up on my caffeine to get the day started. I normally roll in a few minutes before 2:30AM which leaves me enough time to get my things ready to start working on the forecast and turn on ABC just before World News Now begins. Watching it every morning makes time fly by. Its fun light-heartedness helps me wake up and puts a smile on my face...cuz sometimes I just want to be sleeping. Anyway, today they are celebrating their 20th year on-air...and proud to deliver more news to insomniacs than anyone else. 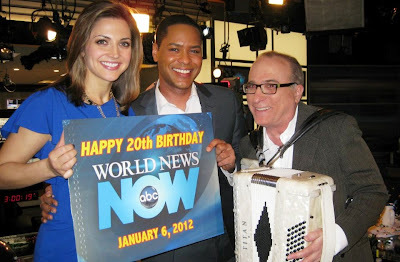 They also always have the "Friday Polka" where Barry Mitchell, a former reporter on WNN, performs a polka song on his accordion to kick off the weekend. I never liked polka until now and the song is stuck in my head and something I look forward too all week...when I hear that song, I know the finish line and sleep is near. Today he played a live version and it was fantastic. I guess overnight people love polka. 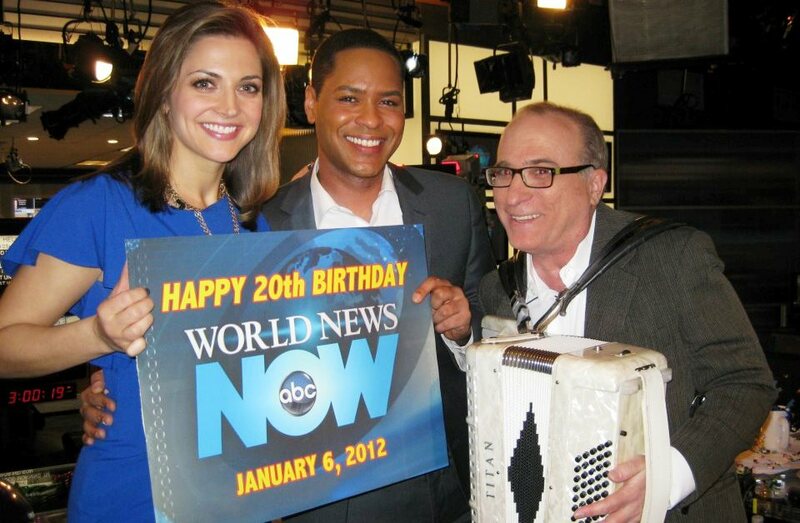 So Happy Birthday and a big shout out to Rob Nelson and his new co-anchor Paula Faris (who used to work at my current station) and all the crew behind the scenes who I frequently tweet in the middle of the night...thanks for making my mornings a little more fun...before we come on-air to continue the fun at 4:26AM. The weather today looks AMAZING! Yesterday we got slightly warmer than the high I was forecasting and today I think we will get into the low 50's, here in Ohio. We should only be in the mid 30's for high temps this time of year. Mostly sunny, breezy, and great today, but a cold front will roll through heading into tomorrow. We will cool back into the 40's for the weekend and early next week, but luckily no decent chance for rain until next Wednesday. We will cool off toward the end of next week, but ehhh, dry and mild until the middle of next week... enjoy it! I know I will be out and around town on my moped later today, hopefully you can try to soak in the great weather too! Have a good one!